How hard can it be? Whilst the principles are easy to understand, it surprises me how many organisations forget about them once into their Lean journey. The following document seeks to explain them in simple terms. Lean principles are used to create precise customer value with higher quality – utilising less human effort, less space, less capital and less time than traditional business systems. Organisations that successfully implement Lean can expect to see an increase in employee engagement, profitability, improved customer quality and delivery. 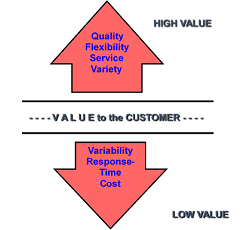 Value – as defined by the end customer. 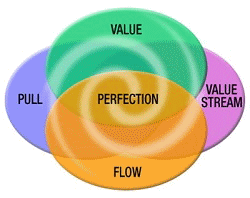 Value Stream – understand the Value Streams that deliver the value and focus on removing the wastes. Flow – develop a business process that ensures the smooth flow of information and material. Pull – develop a flexible and responsive business process which works only when the customer wants it. Seek perfection – whilst we improved today, we must be better tomorrow. It is first worth understanding who the customer is. Toyota considers it to be the end customer, the person purchasing the car. However, in other organisations it’s not that simple. In a court, who is the customer – the judge, the tax payer, the Ministry of Justice or the defendant? Who is the customer on a farm – the cow, the farmer, Fonterra, the consumer? This should be given serious thought as only when you know who the customer is can you think about what they value. Truly understanding what the customer wants is sometimes deeper than just “the right thing on time”. How often does the customer want sales to visit? What is the best way to contact them? How is the best way to invoice them, post or email? Who are their key contacts etc? How often do you talk to your customer to understand what they value? Customers all want great service, in all aspects of their interactions with you so consider all the touch points and how you deal with them. The following diagram explains typical words we give to high and low value. Quality, Flexibility, Good Service and Variety we value highly. We have low association with words such as Variability, Long Response Times and High Cost. Typical examples of long response times are call centres, which can be somewhat frustrating. Variability is the ability to design a process which can deliver different types of product quickly, think of Dell’s online ordering system. Once you understand what your customers’ expectations are then you should make sure all your processes add only that value and nothing else. Easily said, more difficult to do. Typically Value Streams of non-Lean organisations add less than 10%, hard to believe but proven to be correct again and again. Take a walk around your organisation and identify how many people are adding value to the customer! Non-Value Add – the customer does not want to pay for it. Value Add – the customer expects you to do this and will pay for it, in fact the product or service can only be delivered if you do it. Necessary Non-Value Add – customer does not want to pay for it but it is necessary. Example include legislative requirements such as accounting. Develop a process that ensures the smooth flow of information and material. This is not just internally, but upstream with suppliers and downstream with customers. Look around your work place and see where the material stops moving, sits in the stores, waits between departments. Organisations need to redesign how processes work so that both information and material keep moving, and adding value. The idea of pull is simple, only make or take action when the customer requires it. This is for both the end and internal customers. Every step in the value stream should be reviewed with an eye for improvement. McDonalds making the burger when you order it, not before. Dell manufacture your computer when you order it, as opposed to pushing it to a retailer. On the basis that less than 10% of what we do adds value then we have scope for improvement. Organisations need to constantly re-evaluate processes and understand that whilst they might be good today, they must be better tomorrow. To be a competitive organisation you need to focus on making processes better, look for and remove waste. Do you truly understand what your customer wants? If you do, do your employees? How much time is spent adding value? Have a walk round and look at the talking, waiting, looking for information or parts. 15 minutes is all it takes. Do you have any form of improvement in the organisation? In the next article we will discuss the seven wastes which account for the 90% of non-value adding activities.